The prices realized show the increasing importance of CGC certification for classic rock collectibles like these. LEFT: 1967 Jefferson Airplane/Grateful Dead poster, graded CGC 9.4. RIGHT: Jimi Hendrix Experience poster, graded CGC 9.2. A pair of original Bill Graham concert posters from the 1960s certified by Certified Guaranty Company® (CGC®) each sold for five figures at a Heritage Auctions sale in March 2019. The results highlight the growing allure of concert posters from the energetic early years of the classic rock era, as well as the importance of CGC certification. The first poster, promoting a series of Jefferson Airplane/Grateful Dead concerts in Toronto, realized $21,250. Made of cardstock and graded CGC 9.4, it advertised shows in July and August 1967 by a pair of bands that were among the defining sounds of the late 1960s. The Toronto event occurred during the year that Graham was managing Jefferson Airplane, and in which it had two top-10 singles, "Somebody to Love" and "White Rabbit." The Grateful Dead, one of the most enduring bands of all time, had just launched their debut eponymous album. 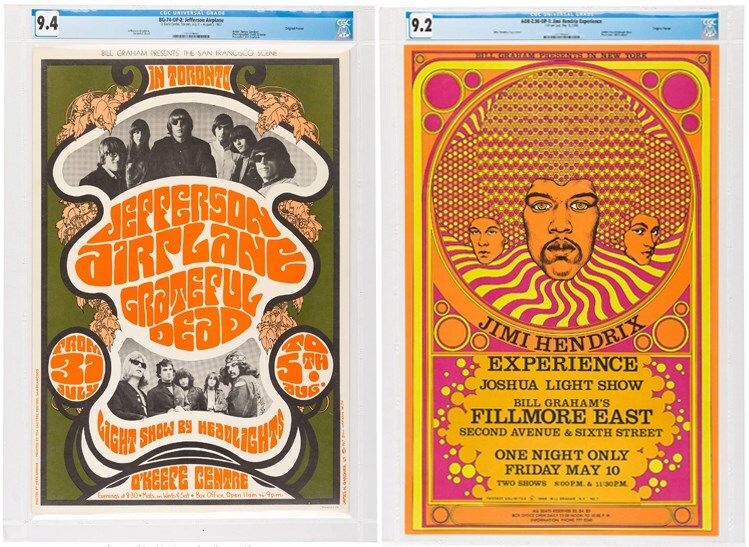 Meanwhile, in the same auction, a poster for two New York shows by the Jimi Hendrix Experience realized $11,250. Graded CGC 9.2, the poster has a psychedelic theme well-suited for the band led by the legendary electric guitarist. The May 10, 1968 shows were held at the Fillmore East, Graham's concert venue in Manhattan, during the peak of Hendrix's short-lived career. Jefferson Airplane, the Grateful Dead and Jimi Hendrix would all appear later at music's defining moment in a generation: the Woodstock festival in upstate New York in August 1969. In addition to Bill Graham, CGC certifies concert posters by Family Dog, Neon Rose, Grande Ballroom and Art of Rock. Under its modern tier, CGC also accepts submissions from Bill Graham Presents, New Fillmore and Moonalice. CGC employs a 10-point grading scale for concert posters that is based on the industry standard the company established for comics, magazines, photos and lobby cards. CGC-graded concert posters are sealed in tamper-evident holders of a heavy gauge archival plastic. The fully transparent front and back allows complete viewing of the poster and protects from any improper handling or soiling.